Ventilex Model VHD extract/supply valves offer all the advantages long associated with the Ventilex range, with one very special addition. Model VHD is also an integrated, 2 hour rated fire damper. The unit operates as a supply/exhaust valve in normal circumstances but is equipped with a thermal fuse and rapid closure spring. lts’ careful design allows full adjustment over a wide range of pressure/flow settings. When the temperature rises above 74°C the thermal fuse releases the closure mechanism. In this closed position the valve has been tested in accordance with BS476 Part 20 and is independently verified as having a 2 hour rating. The whole assembly has an epoxy white finish and is constructed from steel. The valve installs into a fixing frame allowing simple connection to ductwork and easy access for adjustment or cleaning. 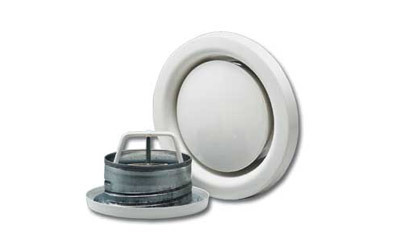 The central core is adjustable and offers a wide range of setting to meet specific system designs. Datum position is achieved when core face is level with face of valve (see diagram below). Bathrooms, kitchens, toilets and lobby areas requiring an efficient adjustable diffuser with integral fire protection.